The Calculator add-in for Tomboy Notes allows you write equations in the text, select them, and have the answer inserted into the text. It is licensed under the GPL and the mathematical operations use the Math.NET Classic library. If you want help, have a bug to report or just want to say something about it, you’re welcome to email me! The source code is available in a git repository. 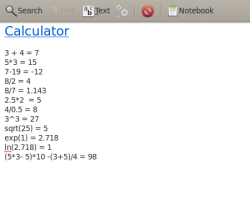 Updated 14/02/2012: Added a preference setting to decide how many decimals the answer should be rounded to. 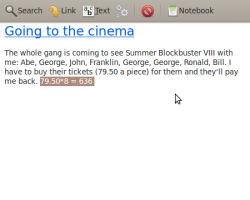 Updated 06/09/2010: Added culture handling to eliminate the bug relating to commas or punctuation marks as decimal signs. Both will now be used correctly regardless of runtime and regional settings. Updated 17/05/2010: Added the optional ability to automatically detect and calculate equations! Also fixed a bug where line breaks woukd stop the add-in from calculating. Updated 02/03/2010: Fixed a crash when trying to calculate without any text selected, and added a shortcut key. Examples of what the addin can do. Very nice addin for tomboy. I have a little question on this addin. How to increase the precision of the result? The default setting only keep three significant figures after decimal mark. There you go, download the new version and go to the preferences dialogue for the add-in and then you can select your desired precision.